Esplora i sentieri backcountry di Punta Cana sul retro di un veicolo 4x4 durante questo tour guidato di 4,5 ore. Fermati in una tipica casa dominicana, immersa nella campagna per assaggiare alcuni prodotti locali della zona, caffè, cacao e tabacco. Fai un tuffo nelle acque rinfrescanti di una grotta sotterranea, poi fermati a Macao Beach per divertirti al sole e alla sabbia. Il trasporto di andata e ritorno da hotel selezionati è incluso. I've done this tour twice. And its nice. The crew is almost nice. There is definitely the chance of encountering wildlife on this activity. A bull had escaped from the fenced area next to our trail and that was frightening and exciting at the same time. Nearly ran over a snake that slithered across the trail in front of my buggy which nearly gave me a heart attack lol. You will get dirty and the dirt will be hard to get out no matter how many times you throw your clothes in the washer so wear something that you don't mind ruining. The helmets are disgusting so I suggest wearing a showercap underneath it. Absolutely bring a bandana to cover your mouth and sunglasses. The cave with the swimming pool is very underwhelming and the vendors at that stop are relentless however if you're good a negotiating, you can get something you want for a low price. My only real gripe is that we didn't get to spend a lot of time at Macao Beach. It's actually my favorite in Punta Cana and we only get to spend about 15 mins there. But I'd recommend this tour. I just completed this tour last week and it was good, however I would have liked more time riding around the island. At first, the ATV my sister was given would shut off after a few minutes. Good think we swapped out the ATV before leaving the grounds, otherwise every time we stopped it would have shut off. The only way to turn it back on was to get off, take the seat off and touch some wires together. Make sure to bring a bandanna or something to cover your mouth and bring sunglasses. There was a lot of dust. The location sells the bandanna's for 5. The cave was really cool to see, however it was very rushed - jumping in and getting right out. I would have spent less time given 30 minutes to spend on the beach. It seemed a little excessive and everyone was just standing around. We're all traveled to the Dominican Republic to be on a beach vacation. I would rather be on the ATV taking in more of the scenery. Overall it was good, but personally i would have liked it to be structured a little differently. I believe from the time we got on the ATV to when we got off was about 90-120 minutes total. EVERYTHING ABOUT THIS TOUR WAS AWESOME!!!! Every time I visit Punta Cana I do this tour! It’s great and fun! A lot of sight seeing, great beach, you get to taste the local coffee and mamajuana. I recommend this tour! FIVE STARS!!! This excursion was amazing! It was nice to see a traditional Dominican house, the cave was absolutely beautiful, and the beach was beautiful. It was a little hectic at first since our group was so big. 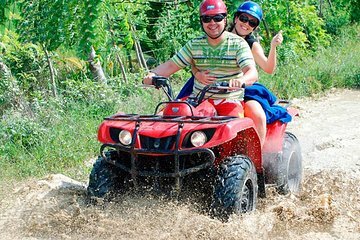 Be sure to tell them that you booked for ATVs and not buggys, since they offer them both at the site. Also, don't forget a bandana for your face as well as sunglasses, you will NEED both. Buy a bandana before hand and bring it with you because they will charge you 5 there. 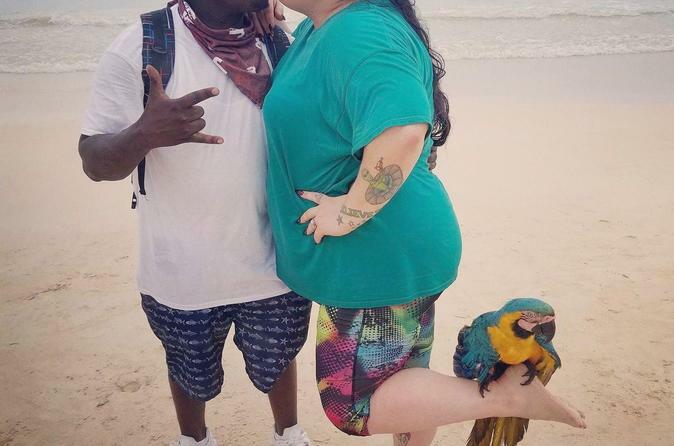 When you get to the beach there will be guys walking around with animals who will take pictures of you without asking. My boyfriend and I took pictures with a monkey and the guy tried getting 20 each from us. That was not happening! We ended up giving him 5. Also, bring money with you to purchase souvenirs and pictures at the end. The tour was amazing! Would definitely recommend! You will be on the go enjoying the experience for the entire time!